The purpose of watching a movie about a saint is to bring about devotion in our hearts. The mix of emotions, the choice of the saint’s kirtans, the screenplay, the dialogues have to be perfectly amalgamated to evoke the right feeling in the viewers. 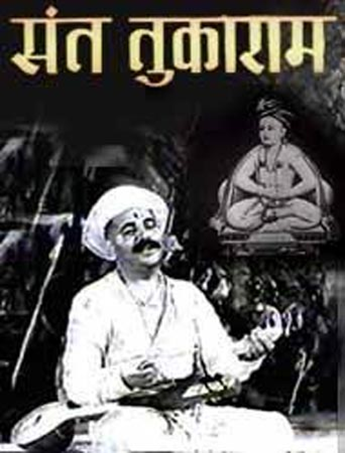 Prabhat Films hit the bulls-eye in this regard when it produced the movie “Sant Tukaram” in the year 1936. This Marathi language movie, based on the life of the famous 17th century Maharashtrian poet-saint, a devotee of Lord Vittala, was a major force in filmdom that has stood the test of time and is revered even today as one of India’s best films. This was the first Indian film to receive international recognition, being adjudged one of the 3 best films of the world at the Venice Film Festival; was also screened at several other film festivals; and in India itself was a major success, breaking box office records, thus proving that true devotion really touches the hearts of people and transcends cultural, geographical and linguistic barriers. The movie was directed by Vishnupant Govind Damle and Sheikh Fattelal, and featured devotional singer and actor Vishnupant Pagnis in the acclaimed title role. The fact that Vishnupant Pagnis’ portrayal of Sant Tukaram was heartfelt and beyond compare, is evident as, after acting in this movie, Vishnupant was so moved by the saint’s life and compositions that he became a life-long devotee and follower of Sant Tukaram. This movie beautifully delves into the greatness of Sant Tukaram showing his different facets — faith in the Name of the Lord, humility, compassion and one-pointed devotion to Lord Panduranga (Vittala). The difficult situations he faced through poverty, his children’s illnesses, his wife’s inability to understand his state of devotion and despite all his so-called troubles, his deep faith that the name of “Panduranga” was the one panacea for all ills are all touchingly portrayed. Sri Sri Muralidhara Swamiji says that a saint’s life is filled with criticism and abuse from people who are envious of the saint’s glory. This movie beautifully depicts such a situation encountered by Sant Tukaram, when his works are plagiarized by a charlatan who also ridicules and scorns at him. The humility of a saint to accept any false accusations as his own wrong doing is wonderfully highlighted in this scene (and in many more in the movie). Believing that he himself has committed a mistake, when Tukaram cries, “Pandurangaaaa, Mavuli, have you forsaken me? You are my everything!” we feel as if we are watching the real saint and we cry along with him. There are other scenes too that are similarly moving — when Tukaram rejects the wealth offered to him by the king, Chatrapathi Shivaji; when enemies attack the kingdom as the king and the saint are in a satsang singing the Lord’s Names; when Tukaram happily gives away to other kids the sugarcane he had worked hard to earn for his own children; the manner in which he falls at the feet of a fallen lady and redeems her. The fact that life, though full of thorns, will become a bed of roses if we have sincere faith in the Lord is beautifully depicted in this movie by interlacing a subtle trace of comedy even in sorrowful situations. The scene where Sant Tukaram drowns his abhangs and waits for 13 days fasting is one that will melt even the stone-hearted. The special effects in this movie deserve a special mention and so do the beautifully scripted subtitles. Let us all watch this movie to sing, dance, cry, laugh and drench ourselves in the bliss of devotion, along with the saint of Dehu. We pray that with the Lord’s grace, many such devotional movies see light of the day.